The NEGRC Northern Challenge is a celebration of Sled Dog Sports. The Challenge is held each year at the end of June and comprises of a competition of some of the fastest Sled Dog Racing Teams in Australia. 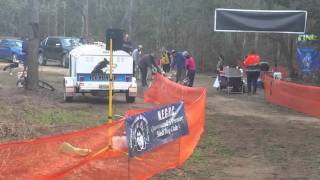 The venue is the Tenterfield Endurance Riders Club Campground located 44 kilometres east of Tenterfield (heading towards Casino) on the Bruxner Highway; or only eight kilometres west of the town of Drake (heading from Casino). The entrance to the forest will have plenty of signs either side of the entrance road and in the forest to help you find the campsite. Please note: You MUST bring your own drinking water for you and your dogs, the water onsite is pumped up from the creek and is not safe for drinking by you or your dogs. Camping is available onsite with hot showers and drop toilets. The Lunatic Hotel in Drake or nearby Blueberry Farm that has bunkhouse style accommodation - ask the Lunatic Hotel for details. Rover Park 4WD Park - approximately eight kilometres west of the forest, they have a large house (sleeps 10), bunkhouse, fixed vans with annexes.